You are cordially invited to attend the 5th Thaap International Conference 2014 on the theme “Culture, Art and Architecture of the Marginalized and the Poor” to be held from 07-10 November 2014 at 43-G, Gulberg-III, Lahore. Thaap Conference 2014 will include the Paper Reading Sessions and a Research Exposition running parallel to it from 07-09 November at 43-G, Gulberg-III. Thaap has organized a Film Screening and a Photography Exhibition on the same theme which will be inaugurated on 8 November, 2014 for private viewing at University of Engineering and Technology, Lahore. The Department of History, Punjabi University, Patiala, Punjab (India) will hold its 2nd South Asian History Conference on 17-19 October 2014 at the University campus. This three day conference aims to bring together historians, academicians, research scholars working on the countries of South Asia viz. India, Pakistan, Bangladesh, Nepal, Maldives, Bhutan, Sri Lanka,Afghanistan and Myanmar to cover the gap in South Asian historical studies. South Asia includes some of the most ancient countries that have made a unique contribution to world culture. These countries have strong regional affinities in as much as they share a common cultural heritage which is not totally indigenous but a product of continuous synthesis between elements, both external and internal. Peoples of South Asia belong to different races, practise different religions, speak different languages and yet share a common civilizational heritage which Arnold Toynbee calls as ‘ Indic’, No country of South Asia can comprehend its own culture adequately without taking into congnisance the cultural traditions of the region as a whole. The aim of the conference is to historically examine the multi-centricity of the South Asian culture and demonstrate the commonness, inner dynamics and nature and extent of interaction amongst the countries of South Asia during different phases of history. It is hoped that the deliberations of scholars at the conference will rediscover the cultural linkages to foster co-operation, harmony, peace and mutuality in contemporary South Asia. This being the centenary year of World War I , one section will be devoted to the significance of this event in world history with special reference to South Asia. All participations are required to register. The scholars are required to register before or on 1 October 2014. The registration fees (which includes accommodation and food for three days) for Indian scholars is rupees 1000/-, for scholars of other countries is 50 USD. The registration fees for Indian research students is rupees 750/-, for research students of other countries is 30 USD. The details regarding mode of payment will be conveyed shortly. The organisers will provide accommodation to the paper presenters only. The proceedings of the conference will be duly published in the form of a book from a leading publisher. Further details about the programme and sessions of the conference will be duly intimated. Kind assistance is requested with researching a collection displaying the dastar as part of Sikhs’ global migration. The collection has three aspirations; to firstly display the pagh’s physical variation as geographically dichotomous and freighting a regionally intrinsic identity trope for instance Makhan Singh as a kalasingha wearing a Kenyan kilemba. 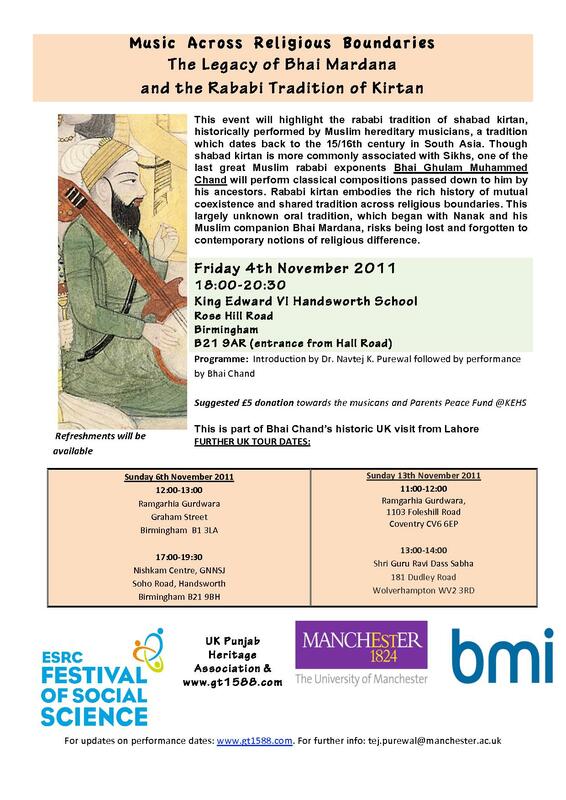 Secondly to consider the pagh and its contentious role in Sikh identity within the milieu of other head-coverings e.g. Mitres in Europe during The Middle Ages. Thirdly to reflect on the pagh in Sikh-Britain relationships e.g. Winterhalter’s 1854 portrait of Duleep Singh or turbaned Sikhs as stock British Armed Forces’ media images. Thoughts on the collection mode and process are especially welcomed. The Horniman Museum Collections can be explored at www.horniman.ac.uk, whilst the researchers can be reached on gorby.jandu@gmail.com and JZetterstrom-Sharp@horniman.ac.uk. The collection is due to gain exhibition in 2014 with displays finalised by end 2013. Call for Papers: This inter- and multi-disciplinary project seeks to explore the contemporary experience of Diasporas – communities who conceive of themselves as a national, ethnic, linguistic or other form of cultural and political construction of collective membership living outside of their ‘home lands.’ Diaspora is a concept which is far from being definitional. Despite problems and limitations in terminology, this notion may be defined with issues attached to it for a more complete understanding. Such a term which may have its roots in Greek, is used customarily to apply to a historical phenomenon that has now passed to a period that usually supposes that Di­asporas are those who are settled forever in a country other from where they were born and thus this term has lost its dimension of irreversibility and of exile. In order to increase our understanding of Diasporas and their impact on both the receiving countries and their respective homes left behind, key issues will be addressed related to Diaspora cultural expression and interests. In addition, the conference will address the questions: Do Diasporas continue to exist? Is the global economy, media and policies sending different messages about diaspora to future generations? The presence and impact of displaced / globalized populations of audiences, spectators and producers of new mainstream /Hollywood/ Bollywood cinema are crucial to the emergence of this post-diasporic cinema, as these narratives from texts to screen constitute a fundamental challenge for the negotiation of complex diasporic issues. Factors are numerous including most prominently, artistic and musical creations, intellectual outputs, and specific religious practices and which have made a significant international impact. The controversial meaning of private/public spaces remain fundamental arenas in the re/construction of gendered identities in an in-between space as a Diaspora context nurtures challenges to traditional socio-cultural behaviors. Virtual Diasporas – This questions a range of pre conceived notions about physicality, actuality and place (which in turn open up the discussions around ownership, representation and nation). Virtual diasporas are not limited to the arts of course but the shifts toward new technologies within art and design production are highlighting such issues through various forms of creativity and the critique that surrounds it. We anticipate that these and related issues will be of interest to those working/researching in philosophy, education, ethics, cinematic/ literature, politics, sociology, history, architecture, photography, geography, globalization, international relations, refugee studies, migration studies, urban studies and cultural studies. In the new global world in which cultures act simultaneously how should we be thinking about Diaspora? Some pertinent questions in this area that the conference is interested in addressing are: What are some of the ways to identity and define the subject in changing political boundaries where cultural interactions are amplified? What are the processes of social formation and reformation of? Diasporas that is unique to a global age? How do an intensified migration age that is coupled with broader and more flexible terrains of social structures can give Diaspora communities a window of opportunity to redefine their social position in both the country of origin and the host country? How does immigration in an age where the media and the internet are highly accessible, bring individuals to deal with multiple levels of traditions and cultures? What new cross-‘ethnoscapes’ and cross-‘ideoscapes’ are emerging in? In what new methods can we capture the web of forces that influences Diasporas at the same time? * Guest workers as diasporans? a) author(s), b) affiliation, c) email address, d) title of abstract, e) body of abstract, f) up to 10 keywords. E-mails should be entitled: DIAS5 Abstract Submission. Please use plain text (Times Roman 12) and abstain from using footnotes and any special formatting, characters or emphasis (such as bold, italics or underline). Please note that a Book of Abstracts is planned for the end of the year. We acknowledge receipt and answer to all paper proposals submitted. If you do not receive a reply from us in a week you should assume we did not receive your proposal; it might be lost in cyberspace! We suggest, then, to look for an alternative electronic route or resend. The conference is part of the ‘Diversity and Recognition’ series of research projects, which in turn belong to the At the Interface programmes of ID.Net. It aims to bring together people from different areas and interests to share ideas and explore various discussions which are innovative and challenging. All papers accepted for and presented at the conference will be published in an ISBN eBook. Selected papers may be invited to go forward for development into 20-25 page chapters for publication in a themed dialogic ISBN hard copy volume. This major international conference marks the culmination of the AHRC-funded project ‘Making Britain: South Asian Visions of Home and Abroad, 1870-1950’, led by the Open University in collaboration with the University of Oxford and King’s College, London. ‘Bharat Britain’ will showcase new research from distinguished scholars, curators and writers worldwide. Held in partnership with the British Library, it will explore the manifold ways in which South Asians impacted on the formation of Britain’s cultural and political life prior to Independence and Partition in 1947. ‘Bharat Britain’ will map the various networks and affiliations South Asians and Britons formed across boundaries of ‘race’, ‘nation’, ‘culture’ and ‘class’, setting up connections which were to anticipate the shape of things to come. The conference will add historical depth and breadth to our present-day readings of ‘diaspora’ and ‘migration’, and counter the common perception that a British monoculture only began to diversify after the Second World War. • Opening of panel exhibition ‘South Asians Making Britain, 1858-1950’, which will then tour the UK. • Launch of online interactive database comprising several hundred entries on South Asians in Britain. Material objects are used to objectify memory; as things with their own trajectories, migrating objects are also used to create new links and new relations, positively or negatively affecting imaginations of community and belonging, making migration a crisis of local/global identification. Migration is not just about citizens crossing borders from homeland to host-countries; it incorporates global movements of things, ideas and people: transnational movements affecting those who move as well as those who don’t. Migration as the crisis of passage moves the traditional paradigm of migration into the realm of the imaginary, in which distant and previously unknown peoples can become connected through materials circulating in this global domain. The same types of objects cited previously can similarly be used to express outward belonging and membership to “imagined communities” not able to be experienced personally, changing persons and altering their concepts of local and global belonging. We welcome papers addressing this crisis and how ordinary people respond to their extraordinary situations through the multiple meanings objects provide. Please send abstracts of no more than 250 words to Dr Florian Stadtler on f.c.stadtler@open.ac.uk, with ‘MB conference’ in the subject line, by 30 September 2009. In what ways did South Asians impact on Britain’s cultural and political life between 1870 and 1950? To what extent did South Asian intellectuals and activists interact and exchange ideas with their British counterparts? What are the legacies of this early diasporic community? This conference will explore the manifold ways in which the presence of South Asians in Britain during the late nineteenth and early twentieth centuries impacted on Britain and influenced the shaping of the nation. It will map out the various networks and affiliations South Asians and Britons formed across boundaries of ‘race’, ‘nation’ and ‘class’. These can be traced in different areas of cultural and political life, from the elitist literary and artistic circles of Bloomsbury where friendships were forged between poets and painters; to the anticolonial organisations which brought South Asian and British activists together in the lead up to Independence; to the battlefields of the two world wars where Indian sepoys and volunteers fought alongside Britain’s youth. Yet these interactions were also, at times, marked by hierarchies and dissent, with South Asians facing barriers in this chapter of their journey to negotiate the peripheries of Britain as well as its ‘centre’. Whether through riot, strike or petition, they struggled for their rights as imperial citizens, shifting ideas of ‘Britishness’ in the process. Held in partnership with the British Library, the conference will address the ways in which South Asians – whether writers, politicians, students or lascars – positioned themselves in Britain during this period, and, in turn, how they were depicted by the British public and in British culture. Further, it will examine the significance of their activities and their influence on the cultural-political make-up of Britain, the ways in which their interventions challenged the national imaginary, and how debates about citizenship and Britishness during the period continue to resonate with contemporary preoccupations regarding Britain’s multi-ethnic identity. Invited plenary speakers include: Humayun Ansari, Antoinette Burton, Chandani Lokugé, Nayantara Sahgal, Amartya Sen, A. Martin Wainwright, Rozina Visram, with more to be announced. Lahore has always been a hub of cultural and literary activities and has produced a lot many men of letter. Most of these activities have traditionally been revolved around cafes and restaurants that served intellectuals, writers and artistes with endless cups of tea and coffee and provided them with an opportunity to discuss subjects and matters close to their hearts and minds. The colonial Lahore was full of restaurants and cafes with most of them locating along The Mall. One such place was the India Coffee House established by two Sikh brothers. Immediately after the Partition, the name India was dropped from the title and it was renamed as Pak Tea House. The Pak Tea House was located opposite to the Coffee House and Cheney’s lunch home on The Mall near Anarkali Bazaar. These two places used to have intellectual gatherings. Cheney’s lunch home was popular with people from different walks of life. University teachers and students were also frequent visitors. The Pak Tea House had had a different status altogether. It was a hub of literary gatherings. Non-residents of Lahore used to call it their information centre that served them round the clock. Giants like Faiz Ahmed Faiz, Sa’adat Hassan Manto, Muneer Niazi, Ahmad Faraz, Mira Ji and Kamal Rizvi frequented the .Pak Tea House which became unofficial headquarters of an eclectic bunch of writers, artistes, musicians and the Halqa e Arbab e Zauq. The celebrated fiction writer, Intizar Hussain, who had been a regular visitor to the tea house since 1949 till its closure, believed it was a cultural institution known all over the sub-continent. No other literary institution of the country, including the Academy of Letters had credibility equal to the Pak Tea House,” he said. He said people freely expressed their political views in the Pak Tea House even in the repressive days of the military regimes of Generals Ayub Khan and Zia ul Haq. Literary interaction as well as literary programmes was the core of Pak Tea House. It was recognized as a National Level Centre as people from all fields and schools of thought visited it. This centre had played an important role in the promotion of literary people in Pakistan but during Sarajuddin’s era the Pak Tea House had faced a couple of disputes as it was a part of the YMCA so the authorities demanded its evacuation and took this case to a court of law. All literary figures and people had protested and the court very fairly announced that poets and writers were the soul of a society and were spiritual guardians and the Pak Tea House was known as a centre of knowledge and depicted the culture of Lahore so this place could not be used for any other purpose. After Sarajuddin’s death, his son Zahid Hasan owned the place. Because of financial constraints and his heart surgery, he wanted to open a garments or tire shop. However, the YMCA authorities again demanded evacuation of the tea house and the court didn’t give any decision at that time and the matter was still pending. The Pak Tea House, having served against all odds for well over 50 years to countless poets and writers of all shades and political stripes, finally yielded to the irreversible forces of commodity culture raging. After the tea house places like Aadbi Baithak in Alhamra and Chaupaal in Nasser Bagh failed to serve the purpose. Many senior writers and poets had died, some have gone abroad. Sarfaraz Syed, a senior journalist and writer who was once a member of the committee of the Pak Tea House said that cities were recognized and respected because of their culture and literature. Photos of Khojgarh and from a recent conference on Guru Nanak which drew guests and speakers from around the globe including India. A sympathetic piece by Zee news. There are ever only a few men, in history or even in contemporary times, who have been so prodigiously placed in a position of the greatest power and at a time when the wheel of history is set for a decisive turn. Neither a man of lineage, nor wealth or even mighty inheritance, Dr Manmohan Singh had little to boast, but for his sharp intellect, quiet wisdom combined with an unalloyed determination to serve his nation that was standing at crossroads, when destiny beckoned him to shape India’s course. A related piece discussing the dominance of Punjabi culture appeared in Express Buzz last month, Oye India, Singh is King by VIR SANGHVI. It is interesting to note the different comments expressed in Express Buzz and Sikhchic who picked up the piece and also posted it on their website. Links to both are below. The last time I went to Colombo (Sri Lanka) a few years ago, I looked at the streets and the people and said to myself, I could be in India. Though a large part of the population of northern Sri Lanka is of Tamil origin, it was Kerala that much of the south reminded me of. But I still had a nagging feeling that something was different: that somehow I was not in India. PRG conference, 25 March 2017, Oxford Brookes University, Oxford.